GRAND CHUTE, WI - The fourth annual Food Fight is here! The Wisconsin Timber Rattlers invite you to create a unique and unusual food item and submit your recipe. We will narrow the entries to a group of finalists. Then, the Food Fight is on! 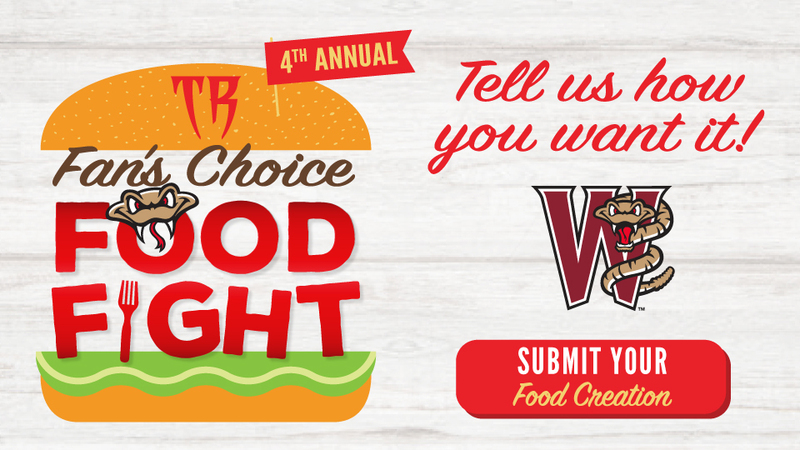 Vote for your favorite entry and the winning recipe will go on the 2019 concession menu at Neuroscience Group Field at Fox Cities Stadium. Rattler Bites won last year. Past winners have also included the Dinger Dog and the Grilled Cheese Chicken Sandwich. Will your idea join our honor roll of past Food Fight Champions? Submit your idea to this link between now and February 22. We will narrow down the submissions to a group of finalists that will be announced on Friday, March 1. Then, it will be up to a vote by our fans to determine which item will be available on our menu. The winner of the 2019 Food Fight will be revealed on Facebook Live with Daniel Higgins, food and drink reporter for USA TODAY NETWORK-Wisconsin, at noon on Monday, March 11. The person with the winning submission will receive four tickets to the 2019 home opener on April 6 against the Cedar Rapids Kernels, a ceremonial first pitch before the game, and four vouchers for their food item!